In his three-day road trip, the Congress vice-president will cover six districts of North Gujarat. Congress vice-president Rahul Gandhi during his Gujarat visit. 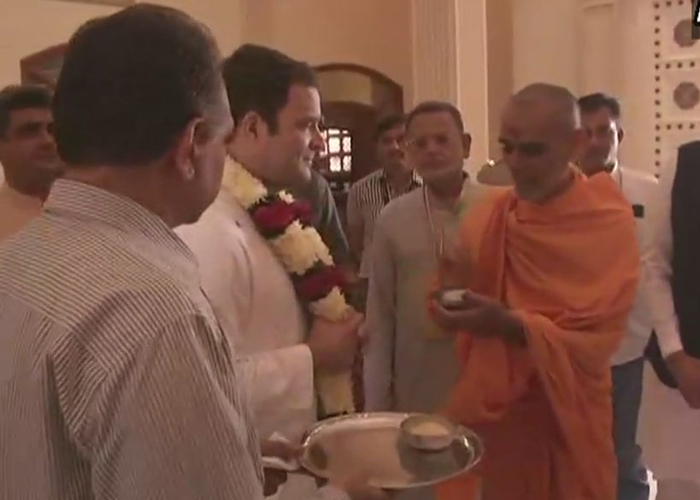 Congress vice-president Rahul Gandhi, who is on a three-day campaign tour of north Gujarat, on Saturday offered prayers at the Akshardham temple in Gandhinagar. A day after the BJP-led Modi government slashed Goods and Services Tax (GST) rates on 177 items, the Gandhi scion in Gujarat said people don't want five different kinds of tax, they just want one tax. He further added that GST requires structural change. #Rahul Gandhi was warmly welcomed in the Patidar-dominated village of Majra with slogans of 'Jay Sardar' on his arrival. #Gandhi sported a 'Patidar' cap during his visit to the village. #On his way to Sabarkantha district, Rahul stopped at a roadside 'dhaba' where he enjoyed the traditional dishes of Gujarat, like 'fafda' and 'gota'. #In his corner meeting at Chiloda, Gandhi emphasised on the role of women in election. #People don't want five different kinds of tax, they just want one tax. GST requires structural change, says Rahul Gandhi. #In the afternoon he will be visiting the Khedbrahmma region, as well as visit the famous Ambaji temple. In Idar, as well as in Vadali, he will have corner meetings, similar to the 'Chai Pe Charcha' type. # This is Gandhi's fourth visit in a row to the poll-bound state. #Gandhi arrived at the Ahmedabad airport on Saturday morning. Then in a completely unplanned move, he headed to the Akshardham temple. #Rahul Gandhi is expected to hold meetings with women, villagers and different communities during the tour. #He will also visit the famous, Ambaji temple, in Banaskantha district. #In the recent past, Gandhi had conducted such campaign tours in Saurashtra, central Gujarat and south Gujarat.